Is there a new Angry Birds game in the works? For the past couple of months, there's been a rumor that Rovio Entertainment is working on an Angry Birds sequel/spin-off featuring the pigs in a more interactive role, perhaps as playable characters. 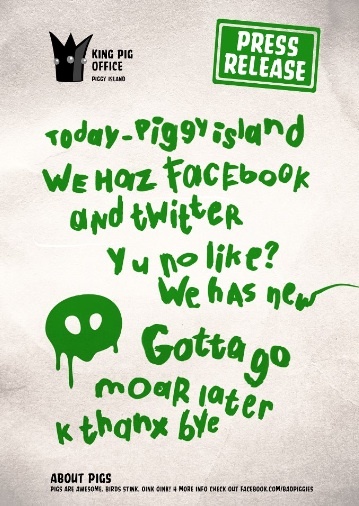 We don't know how much truth there is to that, but we may have moved a step closer to finding out with the arrival of Bad Piggies Facebook and Twitter pages. The tagline? "Pigs are awesome. Birds stink. Oink Oink." Granted, this doesn't point to a new Angry Birds game per se. It could be Rovio's attempt at giving the pigs their own collective voice. That said, we'll report more as soon as new info becomes available.